5. Remembering the person and the couple you were before you decided to start a family. 6. Wishing you could hold your new niece, or any baby for that matter, without feeling like a complete mess afterwards. 7. The fear that your spouse may not be as gung-ho about adopting as you are. 8. Wanting to go away on a trip but worrying that you may miss out on an opportunity while you’re gone. 9. Asking yourself why didn’t you start your family — or end the infertility treatments or begin the adoption process — sooner. 10. Fighting the urge to erupt into tears every time someone asks you how many children you have. 11. Feeling bitter that a couple who started the adoption process after you has just adopted and then feeling guilty about it. 12. Wondering whether you should tell your friends the real reason you can’t make it to their baby showers. 13. Writing about what a great parent you’ll be in your adoption letter without feeling like a fraud. 14. Not knowing whether the expectant mother who has chosen you to raise her child will change her mind. 15. Trying to sound upbeat and excited about adopting even when you’re not. 16. Hoping your child will be healthy — or good-looking or smart — without feeling guilty for thinking about it. 17. Not looking for a new job even though you don’t like your current one because you may need to ask for a huge chunk of time off at any moment. 18. Dealing with professionals who are either too perky or too pessimistic. 19. Always being on high alert, with your bags packed and ready to go, just in case “the Call” comes. 20. Worrying whether you’ll ever get another referral after you’ve turned one down. 21. Finding out you need to update your home study — again. 22. Arriving at the hospital for your baby’s birth without worrying about whether the staff will make you feel like you belong there. 23. Trying to calculate whether you’ll have enough money left over to parent after you’ve paid all of your adoption fees. 24. Wondering if all of your waiting will be worth it in the end. Keep in mind that every adoption story is different. 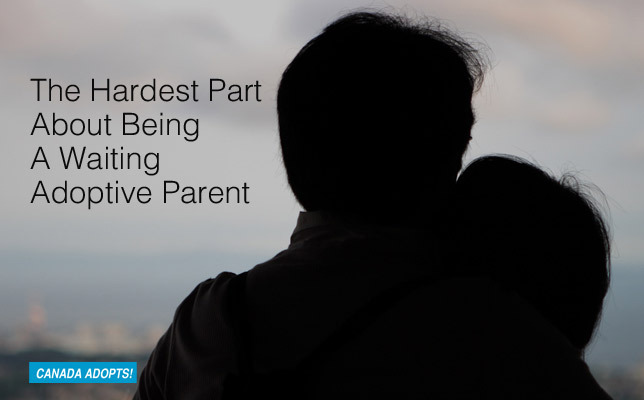 Just because other waiting parents have dealt with some of the items on this list doesn’t mean that you will too. But if you do, just remember: you’re not alone. All expectant parents face challenges and many waiting adoptive parents eventually go on to build strong, successful families. You can too.